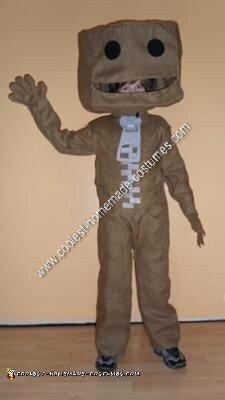 Every year I let my kids be anything they want to be, and this year my son’s choice was Sackboy from the Playstation 3 – game Little Big Planet. To create the head of this homemade Sackboy from Little Big Planet Halloween costume, I built it around a bike helmet with electric fence wire, covering all sharp areas with tape. Next I covered the head with burlap, using a glue gun to hold it in place. I then cut two eyes out of stick on black felt and glued them on to make sure they stayed in place. To create the body I basically measured my son and made each part to cover his body including a torso part, arms which I glued on and legs which I brought up over his hips to give the impression that his legs were like Sackboy’s…. I also made a pair of gloves, and let me tell you – they are not the easiest when you’re making them out of burlap! I am really blown away at your creativity in making these home made costumes. As members of Infolinks, we are proud of you emerging the best website this month. You deserve it. Wish you all the brightest future! Awesome! My son was pac-man last year and it was fun to make! He will be a sack boy this year so thanks for the great tips! My son was Sackboy for Halloween this year and it came out great. Trying to post photos.